Wow - that is a sparkly cupcake, I love it! 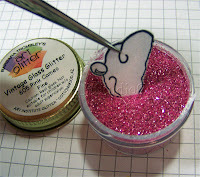 My LSS has some of this glitter in clear and I wondered what to do with it. Now I have to talk her into getting colors - thanks for the inspiration! I second that WOW! 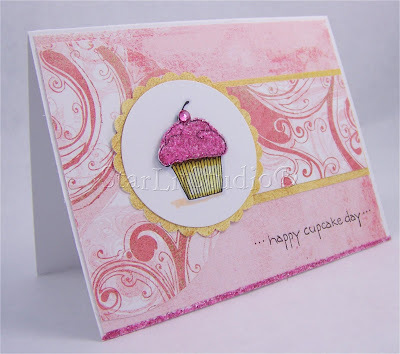 This card looks so YUMMY & is very creative! I'm sorry to read about the loss of your mother-in-law. Beautiful card...love all the sparkles...and thanks for the great instructions. The story about your MIL is hilarious! Sorry to hear about your MIL, and may you have wonderful memories to recall of her. I'm so sorry about your MIL. Her friends' story is adorable! Great card. Cute card, gotta love the sparkle! So sorry to hear of your loss, what a cute story, always nice to find laughter at such a hard time! Bless Larry's heart. He could probably raise his rates and get whatever he asks. Great story. Made me giggle. Beautiful card. Thanks for the tutorial. I really like your card and enjoyed your story about your MIL's friend. Thanks for sharing - I think little stories like this help a person get through the grieving. 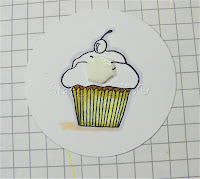 How cute is this cupcake?! Makes me wanna run to the bakery!! I too am soory for your loss, I lost my MIL this past spring. My heart is with you! What a yummy card you made. Your MIL story made me laugh. I know that the loss of a MIL is difficult. My Prayers are with you.